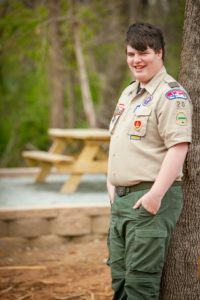 Shay Stallings, 18, son of Gordon Stallings and Kimberly Stallings, earned his Eagle Scout Award on May 14th, 2018. Shay is a member of Boy Scout Troop 20, sponsored by First Presbyterian Church in High Point. Shay has earned four Eagle Palms for receiving twenty additional merit badges beyond those required for his Eagle rank. For his Eagle Scout Service Project, Shay constructed an 18’x18’ picnic area for Tiny Houses Greensboro at their Causey Street site. The site included landscape block walls, leveled pad, two picnic tables, and park grill and will be shared by residents from six tiny houses. Tiny Houses is a non-profit organization that provides residences for the homeless. Shay was presented with the Good Citizenship Award from the Marine Corps League and a Certificate of Recognition by the NC Housing Finance Agency for his support of Affordable Housing through his Eagle Project.